That is one of the most common and critical questions prospective visitors ask when considering a Maldives resort. One of the marquee Maldivian activities, perhaps the best in the world, is snorkelling. And the main event to snorkelling is the ‘house reef’. When I was first introduced to the Maldives by friend and colleague Andy Lees, his main words of advice were to make sure the resort had a great house reef. Of course, the sun, the sand and the overall paradise can be more than enough for a spectacular holiday for many. Also, those resorts poorly endowed in this all things reefy almost always offer many excursions to take guests to excellent nearby reefs for snorkelling. I’ve covered the subject of house reefs on several occasions…’Closest House Reef’, ‘Best House Reef’, ‘House Reef Drop Off’. Distinctive. One of the best house reefs in Maldives in one way or another. Only a handful of these. Problems. Some sort of significant problem or weakness to the resort’s house reef. Usually, the problem is accessibility, but it could be strong currents, no drop off or something else. No information. I haven’t been able to find any details yet on the resort’s house reef. You can filter on this item (see snapshot of ‘Resort Finder’ page above) and the information is included in the Resort Profiles. Reef protection is big and getting bigger in the Maldives. 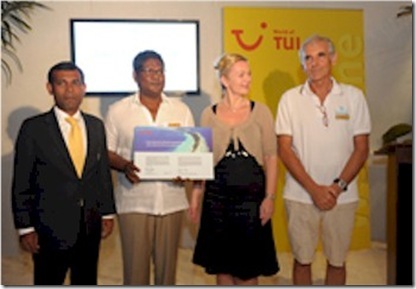 The latest tip of the hat goes to Kuramathi for its accolade from international tour operator Tui for its annual International Environmental Award. 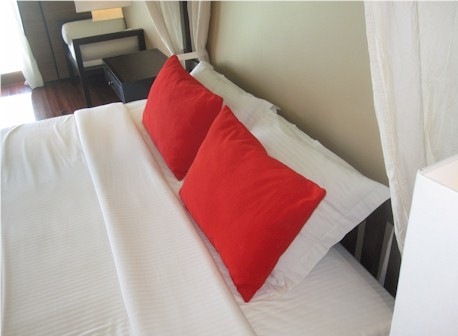 Need a rest after all that clubbing?…that pillow just the right hardness from your throbbing head? I was particularly taken by the last one. After 15 years working at Microsoft, here was a product that I had never encountered. 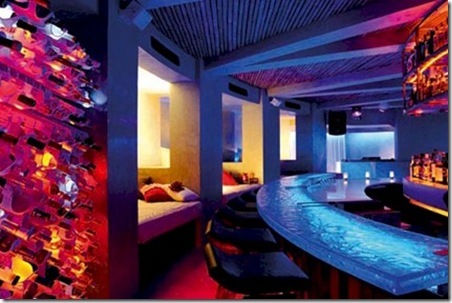 W Hotels often have the trendiest club in town and the Maldives is no exception. A far cry from a keyboard and disk-deck in the corner, the W Retreat’s ’15 Under’ nightclub features international DJs in a swish nightclub below the sands. 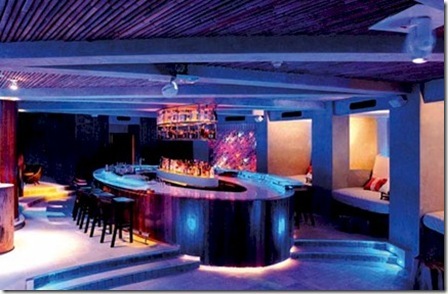 While second-stories are pretty rare in the Maldives, underground venues are even more so. 15 Under is located 15 steps beneath the Fire restaurant. A lot of folks are connecting up with me by email and on our Facebook page. I appreciate all the kind words of support and endorsement. In the About page, I did a bit of a credits page about the various helpers who assisted in getting Maldives Complete on the web, but I neglected to mention anything about the webmaster himself (ie. me). 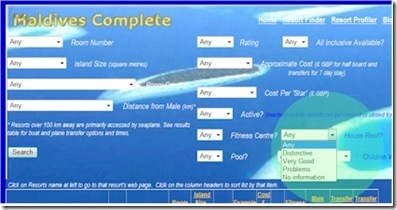 Furthermore, my visits to the Maldives now numbers 17 different resorts and so I thought it would be helpful to share precisely which ones (and ‘when’ as things change quite a bit over time) for people particularly interested in deeper details on those for which I do have first hand information. I’ve assembled the list and a snapshot from each trip as well as a potted history of my background in a Bio page here. Finally, the background to this new page is a photograph from my all time favourite photographer of the Maldives, Sakis Papadopoulos. Sakis has kindly shared a collection of his photographs for my use on the site and over time I plan to migrate most of the site graphics to those from Sakis. 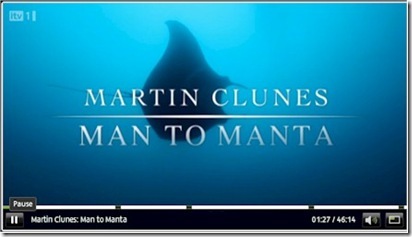 Similarly smitten Martin Clunes recently produced a television show ‘Man to Manta’ on ITV which is on ITV Player. The resort most smitten with Mantas has to be Four Seasons Landaa Giraavaru. 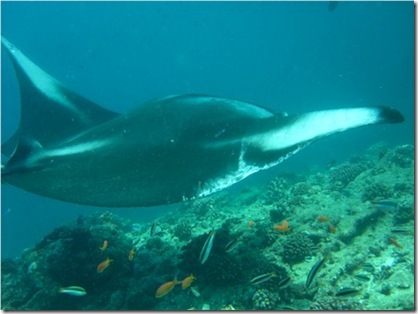 One of the major focus areas of their Marine Centre are mantas where they run their Maldivian Manta Ray Project (MMRP). The programme was founded by Senior Marine Biologist Guy Stevens and is supported by Save Our Seas. It has the largest number of identified manta rays on record in the world. Landaa honours this work with a distinctive Manta sculpture in its Marine Discovery Centre. And, the Maldives section of Clune’s show is filmed at Landaa including an interview with Stevens. The picture above was taken during one of our Landaa dives in November. All that working out got you achy and depleted? Well then, sounds like you need a spa appointment. Something different? Something that evokes the very paradise you are savouring each day? How about Shangri-La Villingili’s ‘Cowrie Shell Experience’ treatment? When I lived in Africa, you used to see cowry shells used extensively. Used in religious rituals. Used in jewellery. They are seen as symbols of womanhood, fertility, birth and wealth. Historically, cowries were used as currency and, in fact, the very first cowries used as such came from the Maldives. Furthermore, the Shangri-La Villingili’s ‘Chi’ spa uses locally produced coconut oil. Lots of resorts offer Ayurvedic style treatments which are indigenous to the sub-continent region (as does Shangri-La), but the cowry shells are a nice touch with their own mystical properties and heritage. The worst thing about working out is the dreary, indoor tedium. Some gyms try to add some distractions with a television screen. But how about being uplifted and inspired by one of the most beautiful scenery on the planet? 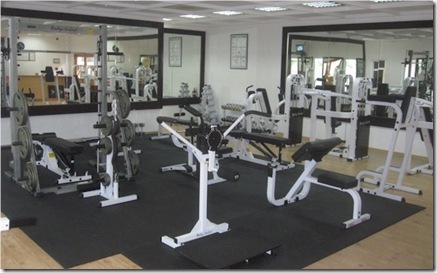 Many resorts along with upgrading their fitness facilities in general, have also taken them out of the back rooms secluded in the middle of islands and moved them to waterside for some inviting scenery to dull the pain. I’m not sure which is the ‘best view’, but the ‘best vista’ has to be Adaaran Vadoo. Vadoo combines elevation with view. It’s gymnasium is on the third floor of its main centre. It is rare to find a second story in the Maldives, never mind a third floor. And the view is set out over the villa lagoon and ocean beyond. For this reason, I chose Vadoo over Traders which has a top floor gym 13 stories up. 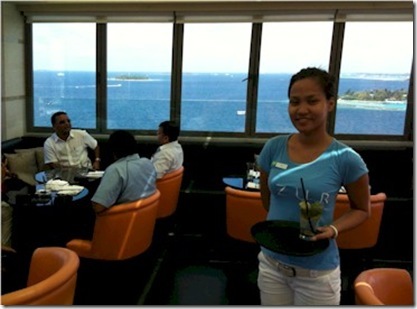 But the windows look out over the which is mostly over the city of Male (the North view from Azur is the great view of the ocean). So your New Year’s Resolution is to get fit? Lose a few pounds? Perhaps work off a few of those Traders mocktails? 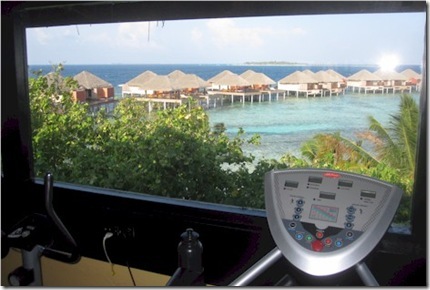 There was a time when the ‘fitness centre’ was an after-thought to a Maldive resort (some would say appropriately so for anything with the word ‘work’ as in ‘workout’ in it). Often a closet somewhere with some random barbells and a tired treadmill. These days, resorts have understood that keeping up fitness (especially with the plenty of rest, time available and buffet temptations) are an important piece of infrastructure. 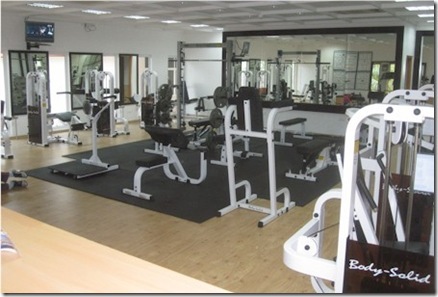 Most of the 4 star resorts and better now have commendable gyms with a range of up-to-date equipment. But the biggest, best-equipped centre I can find is the Hulhule Hotel. 22 machines in total including a rowing machine and cross-trainer. For the class school weight trainer, they have full Olympic free weights with a wider range of benches than my local sports centre in the UK. While all of the resort islands have special licenses to serve alcohol to guests, Traders being smack in the middle of the major population centre has not been granted this privilege. So instead what Traders have done at their rooftop Azur bistro is crafted an imposing menu of ‘Mocktails’ (alcohol free cocktails) that provide as delectable and stimulating refreshment as anything a resort barman will serve up. 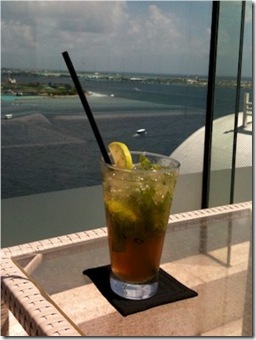 I had the ‘Innocent Mojito’ which is “muddled lime, brown sugar, green tea, mint, soda water”. According to Ria (see photo below). The server (see picture above) who has been there since opening and actually served us on our first visit, told me the most popular seller is the ‘Maldivian Sun’. Others on offer include Lil Rita, Kumiko Sparkle, Byzantine, Lychee and Lime, Chili Pineapple Frappe, Melontini, Cosmo. Speaking of cocktails, Azur also serves the best shrimp cocktail I have ever had with monster prawns (oxymoron I guess).